DRAG RACING is a funny business over here. In the USA it thrives and grows-attracting major sponsors such as Quaker State Oil, Pepsi, Pioneer Hi-Fi, Faberge Brut 33, Winston and other rich names that don't have much clout on this side of the Atlantic, but represent major corporate interest over there. The money involved is Big, with a capital B, easily comparable to Formula One efforts in Britain and Europe. The cars are magnificent, engines are plentiful, spares are over-flowing, transporters are sumptuous and garish, purses are rich and those sponsors are thick on the ground. But in Europe? Not a chance. For decades, the only type of motor racing worth looking at, as far as the majority of large companies is concerned, is the type that goes around corners. Admittedly some corporations, such as Gauloises, Duckhams, Tor Line and recently Twentieth Century Fox, have become involved in drag racing but individual sponsorship of cars is woefully rare. Take a major oil company promotions officer and explain to him the ways of drag racing and he'd shrug in non-comprehension. Describe the shattering roar and spectacle of a 2000+bhp top fuel Funny Car performing a burnout, and you might as well talk to yourself. Talk of the quarter mile strip conquered in 6.4 sec/234mph and puzzlement would be the only reaction. Why, he would ask, do people watch a race that's over in such a short space of time when they can go and watch roundy-round racing that covers 72 laps or so? Well, in drag racing you see six seconds of racing, but you see it from beginning to end, and how much of a circuit race does the average fan see? Not much, I'll warrant, especially at fast, flat tracks such as Silverstone. So-starved of sponsorship money and regular media coverage, apart from that afforded by a few specialist magazines - drag racing is performed away from the gaze of the mass eye. The TV cameras have been to Santa Pod, but botched it. Once, the Daily Mail sponsored meeting at the Pod, but never returned. Where is the World of Sport coverage of drag racing Where is the John Player money the Marlboro commitment, the major oil company investment? The truth is, that these days of recession see sponsors tightening their belt; even for circuit racers. But still not inconsiderable amount of money flows from them. However expansion into untried areas must take a back seat. Drag racing survives in the UK because of the dedication of a few. The prime mover of the sport is Santa Pod Raceway, with its HQ in Bromley, Kent, and its strip at Wollaston, Bedfordshire. The top class of the drag racing world is the Funny Car (or "flopper"), and it's these cars that attract the big crowds. SPR own most of the cars that operate in Britain, but are very cagey in letting out just what their involvement is in terms of cars supplied, sponsorship, and back-up of individual teams.Running a Funny Car is an expensive business, and the only completely independent flopper runner in the UK is the Houndog team, run and owned by team manager NobbyHills, with Owen Hayward as the driver. In the past there have been others, but lack of money and political squabbling between the clubs that govern drag racing have induced racers such as Ronnie Picardo and Pete Crane to turn to the Pro Comp class. Thus it would be fair to say that the British dragster competition has moved down a class, and in this class at least half a dozen top cars are competing. Where does this leave Funny Cars? As far as the crowds are concerned, they don't pay good money to go along and see white hot racing in the second string formula. 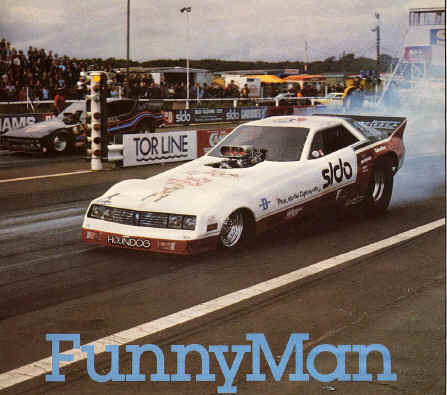 Funny Cars are what they want, and with this demand it can't be long before more' Funny Cars are racing in Britain. Yet Nobby Hills is still the one FC operator in the UK, though there are at least half a dozen in Sweden that visit here. What makes him tick? After all, he has a good job that is demanding and time-consuming, but he manages to keep his Houndog car on the strip, running about 60 timed races during the season. Nobby has been at it since '63, after he saw photographs of a dragster in Hot Rod magazine and decided that there was where his future lay. A demonstration dragste run at Silverstone shortly afterwards convinced him of the wisdom of his decision, and in short order he had a Jaguar-based drag car working. At this time there was very little competition. The only straight-line sport in those days was sprinting. Drag racing is different, however, inasmuch as the cars race each other, not the clock, and if a car performs a slow elapsed time and a slow speed, but crosses the finish line first, it will beat a car with better acceleration and a higher top speed. Thus is the element of exciting competition drawn into what could be a dull pastime. 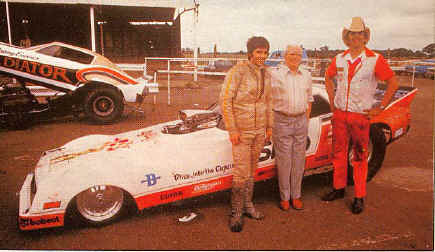 Nobby is in the enviable position of owning and racing his own funny car. His major sponsorship comes from SLD Olding, his employers. They deal in heavy construction equipment of American make, so there is a tenuous connection. In 79, the Houndog team spent £18,000, and that doesn't include the cost of fuel. When that fuel is nitromethane, and costs £21 a gallon, and when you consider that one run -uses seven gallons, then you're in the region of £5,000 a year for the juice bill alone. 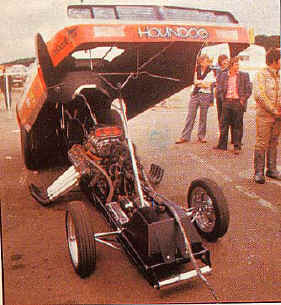 A rundown on the Houndog car gives an idea of the expertise and sophistication of drag racing these days. It's not the backyard motorsport that a lot of people in the business of racing cars think it is. 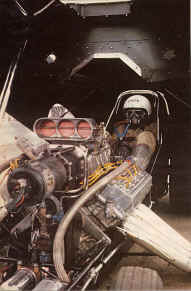 A complete fuel Funny Car engine is quoted by John Woolfe Racing at £16,200. Nobby, however, is proud that he's built his own engine. The Houndog uses a block prepared by Keith Black from a Chrysler 426 cu in unit. Keith Black, along with Ed Pink, is a premier US tuner and parts maker. Keith Black connecting rods are used, together with Pink pistons - Black pistons tend to burn out. The camshaft comes from the Pink workshop, and is driven by Donovan gear drive. The super-charger is a Mert Littlefield item. Nobby would prefer a Pink blower, but as he says: "I'm afraid I only spent a thousand pounds on it." Enderley fuel injection is used, and a Sorrello magneto. Stock Chrysler heads, modified by it Nobby, are fitted. As the fuel is so volatile. Nobby takes great care over which plugs go in. Autolite AG930s do the job — they're special nitro plugs. They're very soft, because Nobby likes to burn a plug rather than a piston, as they're cheaper. He reckons that if you get five or six plugs just starting to burn, then the engine is running nearly as hard as it can be. Manley valves are used in conjunction with Iskendarian springs and Donovan retainers, and the pushrods are titanium. Perhaps the most crucial of the components is the crankshaft. Nobby runs a Keith Black crank, and it costs around £1,200. It has to be perfectly balanced; torsional stresses on a car developing a third of Houndog's power would be unnoticeable, but with 2,000 bhp being transmitted through a crank, a slight vibration quickly becomes a blown engine. This is one of the perennial nightmares of drag racers, particularly for UK teams. In the States, a team carries a spare engine, so that in the event of a blow-up the new motor can be slotted in and racing can continue. But in the UK spare engines are unattainable luxuries. A blow-up for Nobby and Houndog means an end to that weekend's racing, and possibly all racing until money turns up for new bits. If no more than a block side is broken, then it's not too serious, as it can be welded, and a new crank would probably be needed, in addition to various liners and a bore. Then, maybe you've got away with a low cash penalty — just £2,000 or £3,000. The worst that can happen is to wreck both heads, the blower, and completely ruin the engine. In this instance, it's a case of how many parts can be salvaged to put on a new engine. That's more like an £11,000 setback. To avoid this eventuality. Nobby insists that the engine is run "soft"— that is, not at its full potential. The best Houndog run to date, driven by Owen, is 6.4 sec/234.7 mph. This could be improved upon substantially, but the risk of blowing the motor in a big way just can't be taken. "It's the fastest and quickest British-built funny car," claims Nobby. (In drag racing parlance,"fast" refers to maximum speed,"quick" to acceleration.) A funny car is more than just an engine, however. Houndog uses a sophisticated Crowerglide clutch. It's a centrifugal clutch with no static pressure at all, and can be set to "bite" at any speed. This is connected to a Lenco two-speed automatic gearbox. Nobby has been using this box since '74, and would like a new one, because the gear ratio is a bit high. For reverse, the car uses a separate gear outside the Lenco housing. After this is a solid driveshaft which goes back to the rear axle through a very limited slip differential. The axle runs out to 34 x 16 inch Goodyear slicks on Centreline wheels. The chassis is built from 0.05 in chrome molybdenum steel tube designed and constructed by Nobby. There is no suspension - it's not needed, and the wheel-base is short compared to that of a "proper" dragster. It's this short wheelbase, in conjunction with the GRP Dodge Challenger one-piece body, that creates the illusion that the car is not so different from a street car, which gives the FC class its glamour and popularity. That body was built in the US by Ken Cox and shipped over here, where it was put together by Nobby and painted by Ronnie Picardo. Safety plays a big part in Nobby's scheme of racing. Two 15 Ib fire extinguishers are used up front to protect the engine, and one 11 Ib unit goes underneath the driver. Simpson supply the firesuit, boots, gloves and facemask, and the mandatory parachute too. Once the nature of the flopper is understood, it becomes apparent that dedication and money has to be supplied in large amounts to make racing one feasible in Britain. Tony Boden is rumoured to have purchased a funny from the States, so perhaps there will be more competition next year. With more sponsorship cashI injected into his project, Nobby reckons he could buy a new block to replace the current two-year old one. It would be nice to change the two-year-old crank, too. Higher compression pistons would be good, plus an 8-71 blower, and a larger fuel pump. A new blower drive, a lower gear on the transmission and larger tyres at the back, and Houndog would be set to run 6.2 sec, which would be competitive even in the US. Until drag racing becomes a lot more popular in Europe with more than just Santa Pod as a permanent strip, Nobby believes that it will be impossible for a drag racer to become a true pro. There are no pro drag racers in Europe in the same way that they exist in the US. There, a team could be making 60 dates a year — that would easily mean 250 timed runs. Also, large parts of the USA are not, prone to winter as we know it—or rain, come to that. Traction is all important in dragging, so there is no racing in the wet. Perhaps if drag racing caught on in southern Europe it could operate all year. As it is, Nobby runs four times a year outside the UK, mainly in, Sweden at Mantrop Park. There was a dragster demo run at Le Mans this year, so it seems more interest is being generated. Until the idea of big European sponsorship becomes a reality, people such as Nobby Hills and Owen Hayward will continue to run on a part-time basis in what is the Formula One of drag racing,and the only division of it with any hope of a mass audience.